One of the greatest films ever made that takes on the future of mankind in a world where corporations have supplanted countries is the 1975 movie Rollerball. Originally published as a short story in Esquire magazine under the title “Roller Ball Murder,” William Harrison adapted the treatment into a screenplay that was eventually directed by Norman Jewison. This near future story tells the tale of one Jonathon E (played by James Caan) a famous Rollerballer of the Energy Corporation Houston team. Jonathan has risen to levels that are unacceptable by the executives that call the shots, and they want him to resign his roll and retire. Jonathan resists their request simply asking for an explanation. He is told that he has defeated the purpose of the game. He has risen to the level of hero, and heroes aren’t allowed in their newly created society. The admission is made that the game of Rollerball was designed to demonstrate the futility of individual freedoms, and to drive home that being controlled by the corporation is all that anyone should ever desire. Jonathan refuses to surrender as his teammates are heading into a crucial championship that might result in their elimination and possible death. There are many reasons why we think everyone who can should see this film is several fold. One, this film demonstrates a lucid Huxley view of what it would be like if all the current agendas were to play out. Corporations taking over countries. A people governed by technology. Information being hoarded. Centuries of history being lost. Old timers reflecting on the wars that were waged to bring the world to this state of socialistic numbness. Executives who pluck wives from the celebrated, because people are merely glorified slaves to those in power. Secondly, and more importantly, Rollerball tells the tale of the human spirit. The irrepressible force within man that can never be tamed, but that is stifled every day by virtually all who are in power. Jonathan avoids retirement. He avoids death, and he shows an entire planet during one televised game meant to leave one man standing that no corporation can kill the idea of freedom. 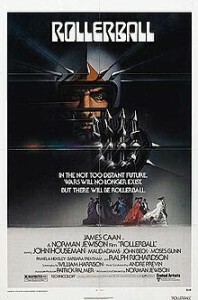 Get the original 1975 Rollerball. It is the international anthem of the human spirit.